Janet's Law takes effect on Sept 1, 2014. A new law signed on August 20th of this year supporting Janet's Law requires the following, effective with this fall's high school freshman class: public school students in New Jersey will be required to learn CPR and how to use defibrillators in order to graduate. Get the benefits of partnering with the Red Cross and save up to 30%! The leader in workplace training solutions can offer your school a one-stop solution. The Red Cross offers an entire suite of health and safety training, emergency action plans, and access to automated external defibrillators (AEDs) that are a required under NJ State Laws. As an organization that responds to more than 70,000 disasters a year we are experts in preparedness. So you’ll benefit from “one-stop” convenience by the country’s premier provider. 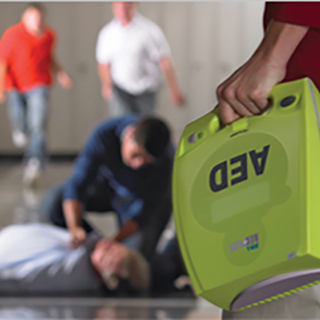 Everything you’ll need from AEDs, and accessories, to service and maintenance plans. Secured discounts with our AED partners - to save your school up to 30%. Flexible classes - online and in-class options to fit your schedule. Modular courses - train in CPR and AED or add First Aid for more comprehensive learning. Digital certificates - fast proof of certification, that's easy to access and print. Mission focused – credible training partner who is dedicated to supporting your community. Free downloadable tools including an Emergency Response Plan template and more. Online self-assessment of current readiness with immediate feedback for improvements. Why was Janet’s Law enacted? Janet Zilinski, 11, of Warren Township, who died in August 2006 of Sudden Cardiac Arrest (SCA) while at cheerleader practice, inspired Janet's Law, just signed by Gov. Chris Christie. It requires AEDs (automatic external defibrillators) at all New Jersey public and private schools. The law, sponsored by Assemblyman Jon Bramnick, R-Somerset-Morris, was the end product of years of advocacy by the Janet Zilinski Memorial Fund, Janet's parents, Karen and Jim Zilinski, and a groundswell of community volunteers.